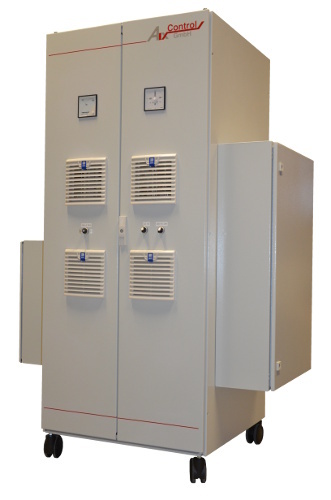 We are able to design a complete power electronic system that is developed to fit the customer’s needs. This includes several aspects which affect the design like safety requirements, easy operability or EMI and noise emissions. Our systems are designed to work in your application, environmental influences like high ambient temperatures, dusty air, condensing water and so on are taken into account in order to build the system you require. We can deliver everything for a complete power electronic system. This includes the power electronic stack, the enclosure, the control system and the software, as well as measurement interfaces, drivers and auxiliary circuitry. All components are developed in house and are geared to each other. This provides also the advantage that interfaces are well known and fit to each other. Our product portfolio of complete systems comprises e.g. test benches for semiconductor stacks, power supplies for various ac , dc applications and custom made products. The above shown converter was completely developed in-house including a custom power stack for extended switching frequency operation up to 20 kHz which is not covered by other available products. Due to our experience in system design we can base new developments on several existing solutions for example various variants of existing power blocks or several measurement interfaces. Most of our components have a flexible design and can be adapted to new requirements instead of being completely new developed. This saves development time and increases reliability because the components are already well known. Also we can design a new system from scratch based on your requirements. Additionally, we can offer support for defining requirements for your application due to our experience. Hence you get an optimal and cost-effective solution which fits your needs. Once the system is defined we start with the selection of the required components and the development of custom parts and software. Every custom part is designed in-house regardless of whether it is a piece of metal or a printed circuit board with additional circuitry. Short communication channels and a flat hierarchy in our company lead to fast and effective design procedure.